This article provides a practical overview of the payment provisions contained within the new Construction Act. It does not delve into the details of those provisions and, if the payment terms in a contract to which you are a party are onerous or confusing, you should contact us for further advice. The term ‘Construction Act’ is used to refer originally to the Housing Grants, Construction and Regeneration Act 1996 (now called the old Act) and recently to the Local Democracy, Economic Development and Construction Act 2009 (now called the new Act). Both of these Acts (the primary legislation) deal in whole with a variety of matters, of which those relating to construction are a very small part. However, that small part is extremely important to anyone providing services in the construction supply chain and seeking payment. In addition to the primary legislation, secondary legislation exists called The Scheme for Construction Contracts (England and Wales) Regulations 1998 and The Scheme for Construction Contracts (England and Wales) Regulations 1998 (Amendment) (England) Regulations 2011. These Schemes provide ‘model terms’ which are incorporated into a construction contract where required by the primary legislation. Generally the Acts accomplish two things: (1) improve the payment process within the construction supply chain; and (2) provide a quick and straightforward method of dispute resolution called adjudication. This article deals solely with the payment process, a future article will deal with Adjudication. The Acts require every construction contract to contain certain provisions with regard to payment and, if the contract fails to provide such provisions or provides contrary provisions, then the Act prescribes that the relevant provisions of the Scheme fills in the gap or takes the place of the contrary provision. The new Construction Act brings in important new payment requirements for all Contracts entered into after 1 October 2011 in England and Wales and 1 November 2011 in Scotland. These payment provisions are complex and not helped by the fact the new Act is drafted as an amendment to the old Act. Similarly, the new Scheme is drafted as an amendment to the old Scheme. Before moving on to the detail, it is worth defining what is meant by a Construction Contract. Generally this is any contract for the provision of services within the construction supply chain excluding those contracts with a residential occupier. In addition, such contracts must be in writing or evidenced in writing (although the new act also catches oral contracts in certain circumstances). The Construction Act states that every contract must provide for interim payments (if the contract period is greater than 45 days); and, for every payment, a mechanism for calculating the sum due; a mechanism for calculating the due date; and a mechanism for calculating the final date for payment. It should be noted that the due date of a payment is not the date by which the payee receives the money due (that is the final date for payment) rather it is the date in connection with a particular payment from which other events in the payment process can be calculated. In addition to the above, the new Act also introduces and requires the payer and/or the payee to issue payment notices in connection with each payment. The payer is the person paying the money, the payee the person receiving the money. The important point to realise is that the sum payable by the final date for payment is, under the new Act, the sum stated in the latest properly issued payment notice. No payment notice results in no payment. A payment notice under the Act is valid if it states the sum due, how that sum is calculated and is issued within the correct timescale. The Act permits two payment procedural options. The first (the default) requires the Payer to issue the first notice; the second (the alternative) requires the Payee to issue the first notice. The flowchart below outlines the procedure. 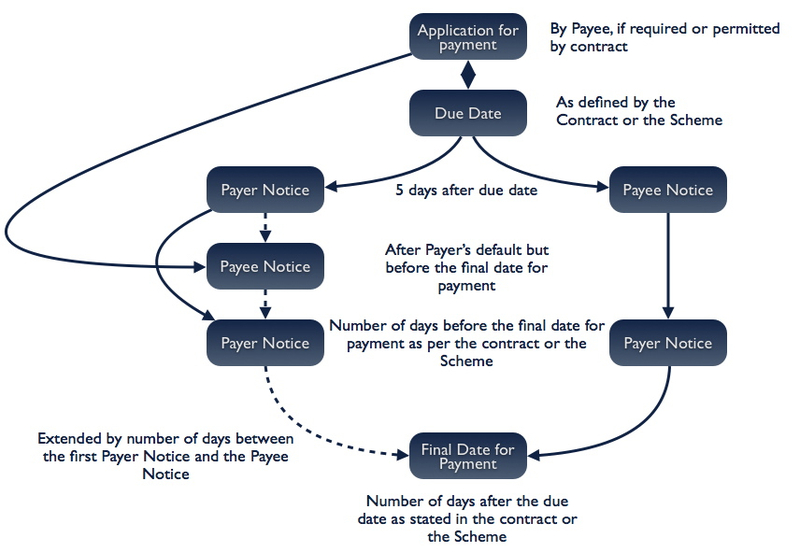 Taking the default option first (the left limb of the flow chart); within 5 days after the Due Date (which will be a date either prescribed by the Contract or by the Scheme), the Payer must issue to the Payee a payment notice complying with the Act. If that notice is correctly issued, the sum due under the Contract and payable by the Final Date for Payment is that sum set out in that notice. The Final Date for Payment is the number of days after the Due Date set out in the Contract or the Scheme. However, if the Payer subsequently decides he wishes to pay less than the sum set out in that notice, for whatever reason, he may issue a second notice (which has been called a ‘Pay Less’ notice) and the sum due under the Contract and payable by the final date for payment is the sum in that Pay Less notice, providing it is issued the number of days before the Final Date for Payment as set out in the Contract or the Scheme. In the event the Payer fails to issue the first Payment Notice within 5 days of the Due Date, following that default the Payee may issue his own payment notice providing he does so before the Final Date for Payment. If that notice is correctly issued, the sum due under the Contract and payable by the Final Date for Payment is that sum set out in that notice. This puts the power back in the hands of the Payee. However, the Payer may still issue his Pay Less notice and the Final Date for Payment is delayed by the number of days that elapse between the default of the Payer and the issue by the Payee of his notice. One final point on this option; if the Contract requires or permits the Payee to make an application for payment before the first payment notice is due, that application, providing it fulfills the requirement of a payment notice, automatically becomes the Payee’s notice if the Payer fails to issue the first payment notice. This means that if a Payer does nothing on receipt of a properly constituted and timely application for payment by the Payee, the sum due under the Contract and payable by the Final Date for Payment will be the sum in the application. The alternative option (the right limb of the flowchart) is a little more straightforward. Within 5 days after the Due Date (which will be a date either prescribed by the Contract or by the Scheme) the Payee must issue to the Payer a payment notice complying with the Act. If that notice is correctly issued, the sum due under the Contract and payable by the Final Date for Payment is that sum set out in that notice. However, if the Payer decides he wishes to pay less than the sum set out in that notice, for whatever reason, he may issue a second notice (which has been called a ‘Pay Less’ notice) and the sum due under the Contract and payable by the final date for payment is the sum in that Pay Less notice, providing it is issued the number of days before the Final Date for Payment as set out in the Contract or the Scheme. Whilst the foregoing is clearly complicated and will, if no payment notice is properly issued, result in no payment for that period, an adjudication arising as a result of a failure to pay will now be more straightforward, quicker and cheaper as the Adjudicator only needs to establish the veracity of a payment notice rather than having to assess the sum due. In addition, the right to suspend work (all or part) on the issue of 7 days notice, for lack of payment becomes a much less risky option.